Stark, David. Reaching Millennials. Grand Rapids: Baker Publishing, 2016. Stark picks up on a timely subject and expands on the work of Kinneman (un-Christian), Hiemstra (Hemorrhaging Faith), and others by presenting a clear understanding of how American Millennials view the institution we call church. He concludes that most American Christians need to have “a very different mindset, attitude, and behavioral pattern… if we are going to engage outsiders with the claims of Christ.” We need to focus on the gospel and seek to remove the obstacles and barriers that are perceived by our current culture. The second half of the book presents a methodology to help churches adapt their strategy and mindset to present the gospel to millennials. I found the book to be insightful and thought provoking. It challenges readers to consider the differences between law, tradition, culture and gospel in the shaping of faith, society, and ethics. He refers to the helpful “Wesleyan Quadrilateral” to help the reader understand how our theology and knowledge of God is formed through Scripture, reason, tradition, and experience. Stark wants his audience to wrestle with the truth of the gospel and how the message of Jesus should be presented, contextually, with today’s youth and younger adults. A review copy of this Book has been provided courtesy of Graf-Martin Communications and Baker Books in exchange for an honest review. A conversation, bridging generations, about critical issues facing the church today. Stiller, Brian. In Insider’s Guide to Praying For the World. Minneapolis: Bethany House, 2016. This simple prayer guide provides 52 daily readings and prayers as the reader is introduced to various nations and people groups. This past week I was given a copy of No Place Left by one of my team members. I was challenged and encouraged as I read through the author’s portrayal of what could happen when a small group of people decide to take the great commission of Jesus seriously. I couldn’t put the book down! A Review of John Burk’s new book, Imagine Heaven: Near-Death Experiences. God’s Promises, and the Exhilarating Future That Awaits You. Burke, John. Imagine Heaven. Grand Rapids: Baker Books, 2015. Have you ever wondered about eternity and what happens to us after we die? After reviewing over one thousand Near Death Experiences (NDE), Burke provides a thought provoking look at what the Bible says, illustrated and illuminated by personal testimonies of individuals from around the world who have tasted death and caught a small glimpse of the afterlife. Contrary to what is usually depicted on TV, not all NDE’s involve a bright light and pearly gates. Burke carefully examines the similarities and differences the the accounts of 100 individuals to develop a pretty vivid picture of what we will experience when we close our eyes for the last time on earth. Some stories portray a heavenly reception while others are quite hellish. I thoroughly enjoyed this book and found it to be both rational and relevant. It helped provide some answers to questions I had at the time of my mother’s death when she described having conversations with Jesus and Angels. We live in a time when big and successful men, especially leaders, are supposed to be strong and composed, at least that is what we think. King shows us his softer side by exposing the pains, traumas, and suffering that God has used in his life to make him stronger. King helps us look at our struggles from a different perspective. When we put God at the center of the equation, we can find hope and meaning in the darkest hours of our lives. King shares some of those dark moments from his own life and reminds the reader of the importance of being vulnerable with others and acknowledging that God is in control of every situation of our lives. I recommend this book to those who may be struggling to see the light at the end of the tunnel or wondering how God could ever use their current trial to bring about something positive. *A review copy of this Book has been provided courtesy of Graf-Martin Communications and Baker Books in exchange for an honest review. I must admit that it seemed odd to read the old familiar story of the book of Acts in modern language. Something about Jesus’ body being loaded in an SUV and buried in a Crypt and his assertion being described as “Jesus flew off to Heaven,” seemed odd and irreverent at first, but as I journeyed along with the Author through the exciting events of the book of Acts, I was drawn into the story as if it were today’s headlines. Mkialatos does an incredible job of engaging the reader within the drama of the Acts of the Apostles. It is a fresh new telling of the old story that catches the reader off guard and helps him hear and see things that he may not have noticed before. It is an exciting story from cover to cover and a great way to introduce the birth of the church and the work of the Holy Spirit through those who followed Jesus. Hearing the story afresh just might encourage us to tell the old story again and again to a new audience, who are ready to hear the good news. An insightful and creative read. Donahue takes the reader on a journey back to the last supper, in the presence of Jesus in the upper room, and invites us to experience community the way the disciples experienced it with Jesus. Donahue recreates the experience from the perspective of the Disciples who were there and demonstrates the importance of community for each one of us. This book is a creative look at how to develop meaningful communities where people can find a sense of belonging, service, and fulfillment in life and ministry. *A review copy of this Book has been provided courtesy of Graf-Martin Communications and Bethany House in exchange for an honest review. The fastest growing religious grouping of people in America is those who identify themselves on surveys as “none.” Those who self-identified as at least nominally affiliated with a religious group in the past are increasingly finding it easier to just check the box that says, “none.” This book examines who these people are, why they are disassociating with religion. Gansky, Alton. 30 Events That Shaped the Church. Grand Rapids: Baker Books, 2015. Through outstanding writing, Gansky takes the reader on a time traveling journey through the development of the Church as we know and recognize it today. The author introduces us to some of the church fathers and creeds that shaped the early formation of the church and then traces the influence of scientific and social developments of latter centuries which have molded the church into what it is today. This is a brilliant presentation of church history by a master story teller. The chronological presentation of key people and events makes church history accessible and relevant for any interested readers. I highly recommend this volume to all Christians. 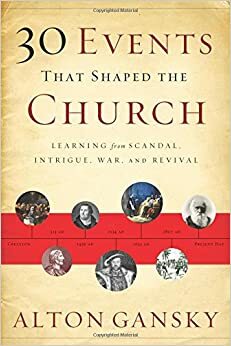 Unfortunately, most of us know very little about the history of the church, Gansky takes away many of our excuses by making it entertaining and easy to understand. Pellowe, John. The Church At Work. Elmira: Canadian Council of Christian Charities, 2012. Pellowe brings his experience as the director of the Canadian Council of Christian Charities together with careful examination of biblical and historical precedents to reflect on the relationship between church and parachurch ministries. The book provides a clear understanding of the latent tension experienced by many who caught within the church and parachurch interplay. He sees the two as complimentary and provides helpful tools for reflection and understanding. The Final chapters of the book suggest how churches and parachurch ministries can enrich their relationships and work together to build the Kingdom. 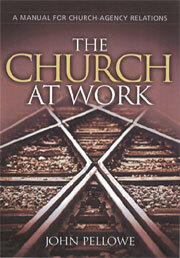 I recommend this book to clergy and laity within the church and to those who are involved in parachurch ministry. It will open the reader’s eyes to understand the root of historical tensions and provide a foundation for building trust, accountability and communication that lead to renewed relationships and collaboration. *A review copy of this Book has been provided courtesy of Graf-Martin Communications and The Canadian Council of Christian Charities in exchange for an honest review. Jim Stump says that he won the job lottery when he became a full time mentor to college athletes at Stanford University. A review of Gregg Matte’s Unstoppable Gospel: Living Out the World-Changing Vision of Jesus’s First Followers.